Hi, this is our first blog post to go along with the grand opening of the Supreme Party Machine here in Central Florida. It’s been an idea we’ve had for awhile – a friendly, interactive, safe environment for people of all ages. 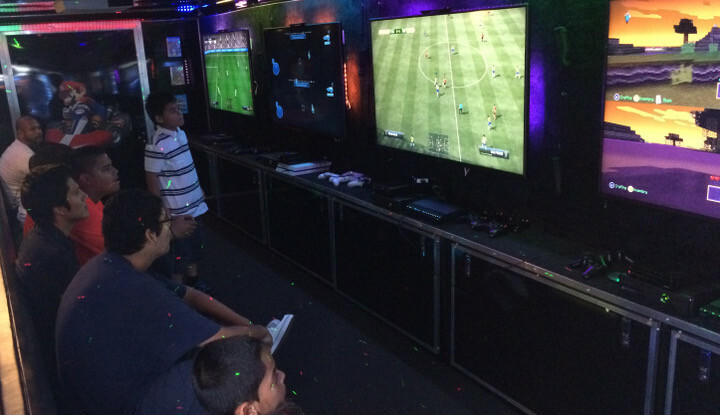 Now it’s turned into reality as our mobile gaming theater is ready to get this party started! We’ve got everything needed to pull up to your front door with our game theater and let everyone have the time of their lives! With our huge selection of games, you can try cooperative games to adventure through with your friends, or competitive games to test their skills! Working on installing the LED Lights around the inside of the theater. I’m really a big fan of the ambient lighting and atmosphere they add. The lights have a control unit that can show off a variety of cool colors and effects. Right now we’ve set the lights to “chase” down the length of the theater as they change color. The LED strips are running down the length of the ceiling and along the floor underneath the seating. It looks absolutely fantastic and we’ve gotten a lot of positive feedback. Picked out some game posters for the back walls inside the theater. Good old Mario and Zelda posters, along with Skylanders, Minecraft, and more. Found some frames that fit the posters nicely. With the spotlights from the light track showing on the posters, they add a nice effect to the atmosphere inside. We’re getting the interior of the theater starting to look more like how we initially envisioned it. We’ve set up the wiring inside the game theater. 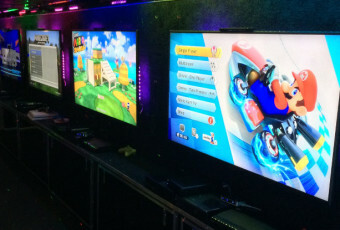 Each console is going into a splitter that connects to the TV, so it’s easy to switch between Playstation or Xbox or Wii. Audio cables are run under the flooring to our soundbars and transducers. The soundbars are right by the seating so each gaming station can hear their own game even while the other gaming stations are blasting sound out. The transducers are under the seating, which adds an awesome rumbling effect during peak moments of a battle. When you experience that for the first time I’m sure you’ll agree how much it adds to the action.